What a way to finish four great nights in Amsterdam. John Noble from the Zoo was in the house again, here's how he found it. There was something in the air.. a different vibe surrounding night 4 in the Ziggo Dome. Was it adrenaline, still in the system from night 3? #U2ieTour innocence broken, bit exhausted, still processing all of that? ‘Afterglow’? From early on it was lift off alright. Vertigo. That intro was nailed to the floor.. timing tight to the millisecond… uno, dos, tres, CATORCE! … that momentary musical stop before ‘Hello Hello’ - timed perfectly with my own heartbeat. LIFT OFF occurred in that moment. I was already Out Of Control, (back in spot 2 in the set), and so were the GA fans. Bouncing. All of this.. all of this can be yours. Walk away, walk away. I will follow…. In unison we all sang it. We did follow. It was great to hear that the band had been spending some time with Anton Corbijn, Bono told us of the day spent with him on Hargen Beach, and that photos taken that day may appear on the Songs Of Experience cover! Wow. Read John's full report here - and if you were you at the final night at the Ziggo Dome add your own review and photos here. Finally Magnificent was played. I hope it will be performed again on october 14 in Antwerp. A song from No Line appears. Not my favorite but I understand they are going with hits and songs from Songs of Innocence. Best U2 Gig ever !!! Thanks very much for this awesome show. Fourth night in Ziggo dome was the best show for me. Bad and 40, as magnificent ending. Thank you guys!! What an amazing night, 13 Sept! I was lucky to see all 4 gigs, and the last one just blew me away! And even more, I think Holland was part of SOE: There was a photoshoot with Anton Corbijn and we heard Magnificent in a NEW SOUND ! I guess, this will be the fresh, colourful sound of SOE !! The guys brought BAD back to the Netherlands, what a wonderful song that is. And then flowing over in to psalm 40. This was a worthy end to a fantastic visit to my litte country. I will Always Love. I was not there in body but in spirit I have been following the Amsterdam shows through some good folks inon mixr in our u2 forum and I predicted Bad, 40 and Magnificent and you played it. Great, great shows. Just like Montreal on the first leg. I will follow every show. Thank you. Montreal loves you. This morning our first granddaughter Noreen was born! Going to see the show tonight! Her dad is coming too! It is a BEAUTIFUL DAY! Dear Guys, sunday i am coming to THE concert my request is can u please play RUNNING TO STAND STILL that is still my favorite U2 live song ever ,so i can sing it along with my girlfriend to who i am getting married 9 th of november this year. Many Many thx. See u all september 13th Love, Race!! Im going from Portugal and i would love you play Bad. Its my 4th show. 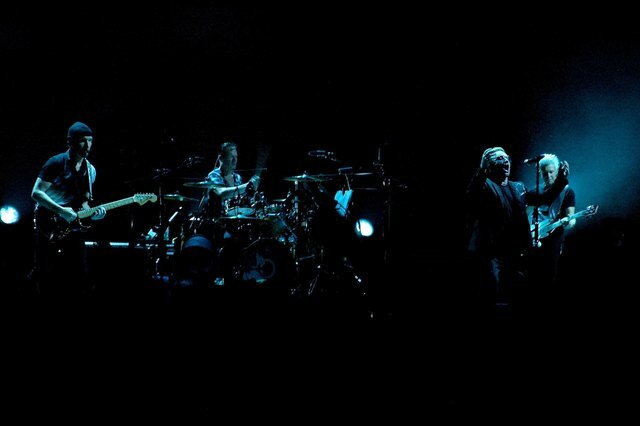 there are a lot of songs i want to here but i hope u2 will play the old songs more often. please play this night surrender or a sort of homecoming because i will be there in Amsterdam! !